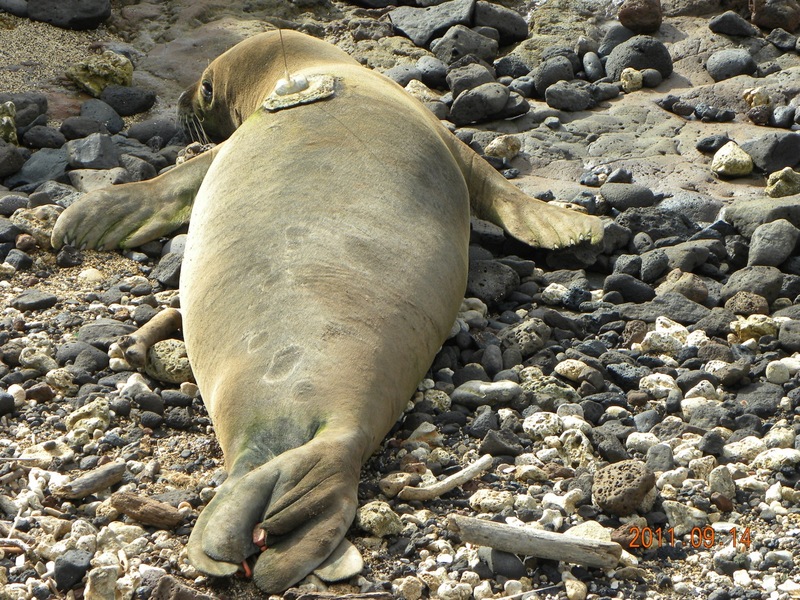 A two year old male, RN44, was discovered at Waipake on April 3 with a large ulua hook in his left cheek. A heavy monofilament leader with swivel was attached to the hook and extended 18″ outside RN44’s body. Unfortunately, RN44 was resting on a large lava bench where he could not be safely captured, so we had to wait until he hauled up in a safe location. RN44 was re-sighted on April 8. He attempted to haul-out several times along Waipake Beach, however the leader kept getting caught under his body and pulling on the hook, creating obvious discomfort. This action prevented him from hauling-out. 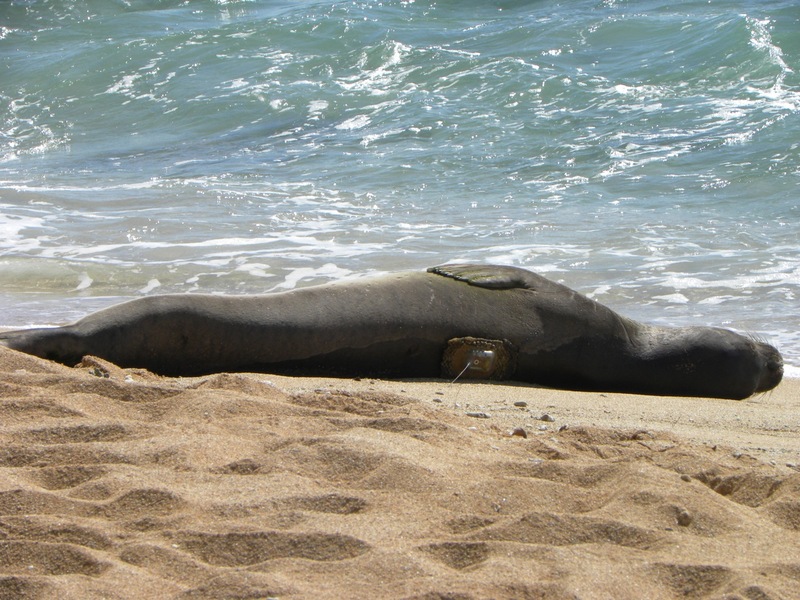 He was more successful on the morning of April 10, where RN44 was found sleeping several feet above the wave wash at the south end of Lepeuli Beach. A visual examination revealed the hook’s barb had pierced his cheek. A team assembled, safely caught him, and using a bolt cutters, successfully removed the hook and leader. We are saddened to report that RB24 has passed away. RB24 had been a seal of concern that PIRO and PIFSC had been closely monitoring for the last few months. She was one of the four seals brought into temporary captivity during a tugboat oil spill in January. In early March, she miscarried her second pregnancy. 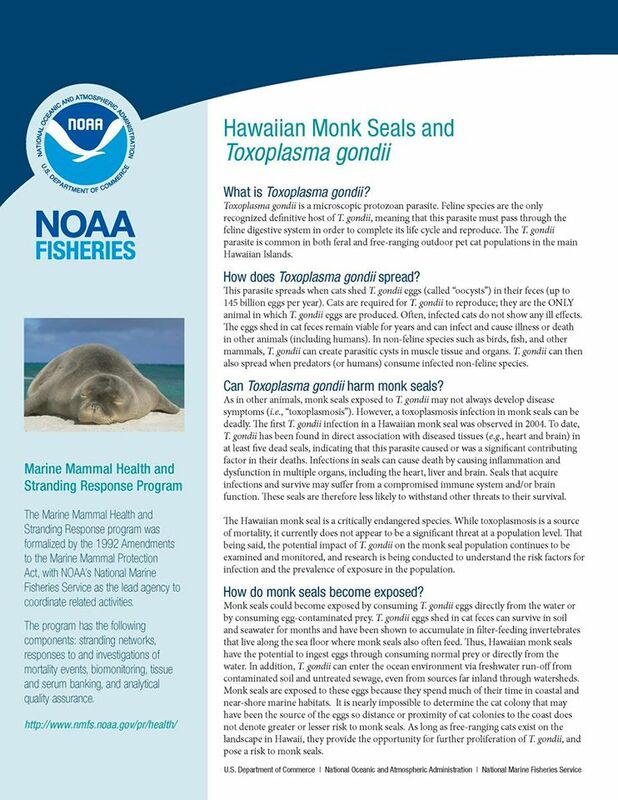 During the last few months, RB24 had frequently been reported logging in the waters off Ko`olina on O`ahu. After close observation, she was eventually brought into captivity for assessment and rehabilitation. Shortly thereafter, she passed away. A necropsy was immediately performed. Results of the necropsy were released this week. 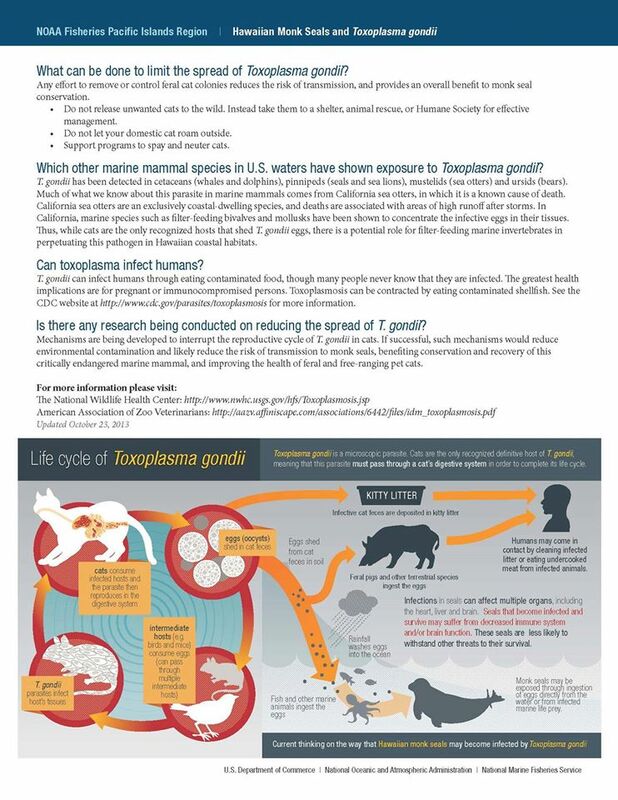 It appears that mortality was caused by Toxoplasma gondii (see below) infection that affected the brain, lungs, fat, heart and other organs. The Toxoplasma parasites were widespread throughout her body, but where most severe, they led to inflammation in the brain and severe tissue degradation in the blubber and internal fat stores. The inflammation seen within the blubber was likely quite painful and explains why RB24 had such a reluctance to haul out or move around. The infection in the lungs led to a series of inflammatory processes that made it difficult for RB24 to distribute oxygen to her tissues, including those of her unborn pup. That lack of oxygen, in addition to the placental damage caused by Toxoplasma, explain why she aborted the fetus. Ultimately, RB24 died of respiratory failure because of the inflammation caused by the parasites in the lung. There is little chance that a Toxoplasma infection of this severity would have been treatable. 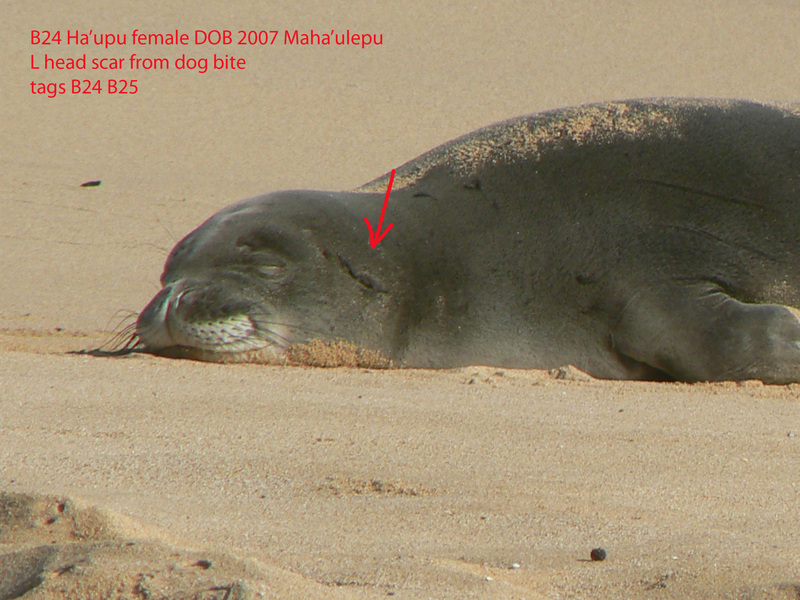 RB24 was born to RK12 at Maha’ulepu on Kauai in 2007, the first of several pups RK12 was to have at Maha’ulepu under the shadow of the famous mountain, Ha’upu. As a pup RB24 survived a dog attack that left scars on the left side of her face. 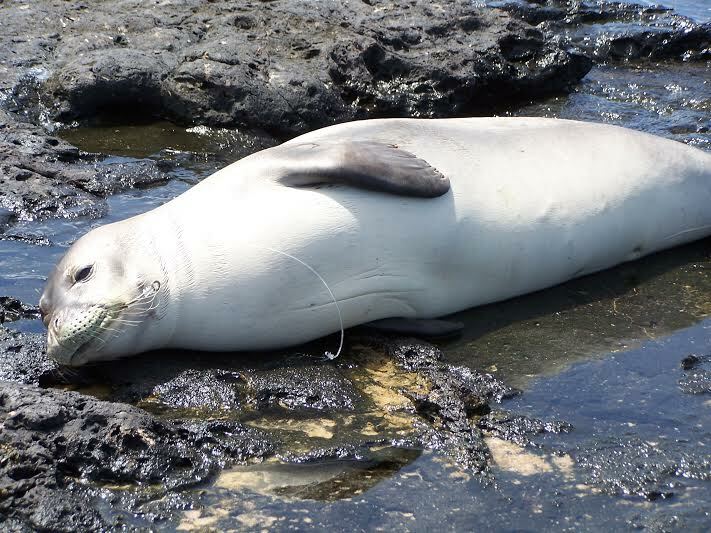 She spent much of her sub-adult years on the east side of Kauai, especially at Lae Nani one of her favorite places to rest. As an adult she moved to Oahu, occasionally returning to Kauai to molt or just to visit.